Dorko Line Logo Tank Top férfi ujjatlan t-shirtA plüss logós pamut atléta a DRK 2018-as tavaszi / nyári kollekció egyik legmeghatározóbb darabja. A szürke hétköznapokon is kifogástalan, üde megjelenést kelt.anyag: pamut..
Slazenger Sleeveless Mens T Shirt This Slazenger Sleeveless T Shirt offer great ventilation and comfort thanks to its 100% cotton construction, styled with a round neck and no sleeves this T shirt is given a casual look. 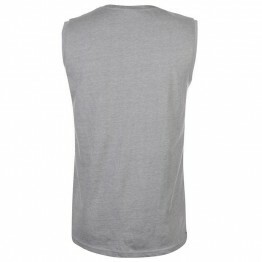 Brand recognition is given thanks to its embroidered Slazenger logo.> T Shirt >..
Slazenger Muscle férfi trikó This Slazenger Muscle Vest offers great ventilation and comfort thanks to its cotton construction, styled with a round neck and sleeveless design and a muscle back to give this vest a casual feel. A contrasting piped trim is displayed around the collar and sleeves for a ..
Nike Cross Over férfi trikó Work hard and feel great with the Cross Over Tank Top from Nike. Crafted with a rounded neck and no sleeves, this lightweight top is perfect for training. A printed Nike Swoosh is located to the front of the chest to complete the overall look.> Tank top > Lightweight > ..
Karrimor X Lite férfi futótrikóPart of the X Lite range this Karrimor Running Vest has been crafted with a Lycra blend offering total freedom of movement, with DRX Moisture Management Fabric Technology to keep you cool and dry.> Mens running top> Short sleeves> Crew neck> DRX Moisture Wicking> Breat..
Dorko Sailor Tank Top Men férfi ujjatlan t-shirtA SAILOR TANK TOP tengerész motívummal ellátott trikó,a nyár slágerterméke.Pamut anyagának köszönhetően igazán kellemes viselet.A nyári trend kötelező darabja.anyag: pamut.. Chest Stripe Vest by Soviet > Premium vest> Lightweight> Sleeveless> Crew neck> Ribbed trim> Split hems> Block colour> Chest stripe> Rubber logo badge> Soviet branding> 100% cotton> Machine washable at 40 degrees ..
Everlast Str férfi trikóHit the gym in style with this muscle vest. It's a regular fit with a racer back and round neck. Large Everlast branding sits on the front. 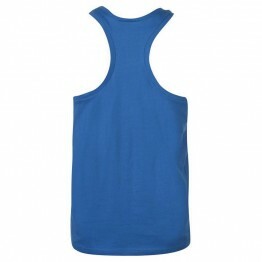 > Men's vest> Round neck> Racer back> Everlast branding > Body: 75% cotton, 25% viscose> Rib: 70% cotton, 25% viscose,..
Slazenger Sleeveless Mens T Shirt This Slazenger Sleeveless T Shirt offer great ventilation and comfort thanks to its 100% cotton construction, styled with a round neck and no sleeves this T shirt is given a casual look. Brand recognition is given thanks to its embroidered Slazenger logo.> T Sh..
Pierre Cardin Cut and Sew Marl férfi trikó The Pierre Cardin Cut and Sew Marl Vest is a cotton construction to offer a lightweight, breathable feel. This look is complete with a panelled design that is nicely finished with an open pocket that features subtle Pierre Cardin branding.> Vest > Lightwe..
Lonsdale Boxing Vest Mens Ideal for training, club or competition wear, this Lonsdale Boxing Vest benefits from a quick drying fabric offering improved performance along with a contrasting trim for an eye catching look. 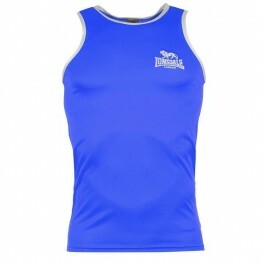 This Mens boxing vest features an embroidered Lonsdale logo for an authentic to..